The McKnight Brain Research Foundation (MBRF) is pleased to announce the appointment of Amy McGuire Porter as its Executive Director (ED) effective, April 1, 2018. The ED is the chief management officer of the MBRF and reports directly to the Board of Trustees (Board) through the Chair of the Board. The ED serves as the lead representative of the organization, along with the chair and as its primary spokesperson to all stakeholder groups. 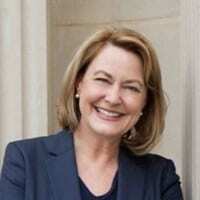 Amy has served as a non-profit professional for over 30 years with 16 years’ experience serving as executive director and CEO of two national, health-related organizations – the Foundation for National Institutes of Health (FNIH) from 2001-2010 and the National Osteoporosis Foundation from 2010 through 2017. During Amy’s nine years as Acting and then Executive Director of the Foundation for the National Institutes of Health (FNIH), nearly $500 million in contributed revenue was received and for four consecutive years the FNIH received Charity Navigator’s highest 4 Star Ratings. The development of a pioneering form of public-private partnership that produced the Alzheimer’s Disease Neuroimaging Initiative and the Biomarkers Consortium, are major achievements under Amy’s leadership. Under Amy’s tenure at FNIH, the Bill and Melinda Gates Foundation provided $200 million to design, launch and manage Grand Challenges in Global Health, a five-year grant program to foster innovation in solving key global health and development problems. In addition, FNIH managed the Mouse Genome Sequencing Consortium, issuing $24 million in grants to three academic centers, speeding up the determination of the DNA sequence of the mouse genome. Other major programs developed during her tenure include the Genetic Association Information Network, a program to genotype existing research studies combining the results with clinical data to create a new resource for genetic researchers and secured the funding for the design and constructions of the Edmond J. Safra Family Lodge and Garden on the NIH campus. The Research Partnership in Cognitive Aging, a public- private partnership with the National Institute on Aging and the McKnight Brain Research Foundation to support research on age-related changes in the brain influencing cognition and memory loss associated with normal aging, was formed during Amy’s time as ED of the FNIH. In 2010, Amy became the CEO and Executive Director of the National Osteoporosis Foundation (NOF). In her role, she was the primary spokesperson to all stakeholder groups. She was responsible for overseeing strategic planning, operations, and administration of the organization. Additional duties included identifying and developing educational and research priorities, enhancing the NOF image and enriching all levels of engagement with patients, caregivers, physicians and the public. In Amy’s first year at NOF, she established the National Bone Health Alliance (NBHA) based on the Biomarkers Consortium model developed at FNIH. Under NOF’s management, the NBHA has become a successful consortium of over fifty-member organizations joining together to advance research, advocacy and education in osteoporosis and rare bone diseases, and to promote bone health. NBHA members include other nonprofit organizations, medical societies, pharmaceutical and diagnostic industry partners, and nutrition and exercise companies. The NIH, FDA, NASA and CDC participate as advisors to the NBHA. Amy has a Bachelor of Arts degree from Kent State University and attended the Master’s in Arts program for non-profit management at the University of Akron. In 2005, Amy was the recipient of the National Institutes of Health (NIH) Clinical Center Director’s Award for her work in support of NIH patients and their families. In 2009, Amy received the Honorary Alumna Award from The University of Akron for her work in support of health and biomedical research. In 2017, Amy received the New Jersey Interagency Council Professional Award and was appointed as a member of the Stakeholder Advisory Committee to the CEO of Pharmaceutical Research Manufacturers of America ((PhRMA). The purpose of the MBRF is to promote research and investigation of the brain that underlie the neurobiology of memory with clinical relevance to the problems of cognitive decline and age-related memory loss. Amy’s background and experience make her uniquely qualified to serve as the Executive Director of the McKnight Brain Research Foundation.